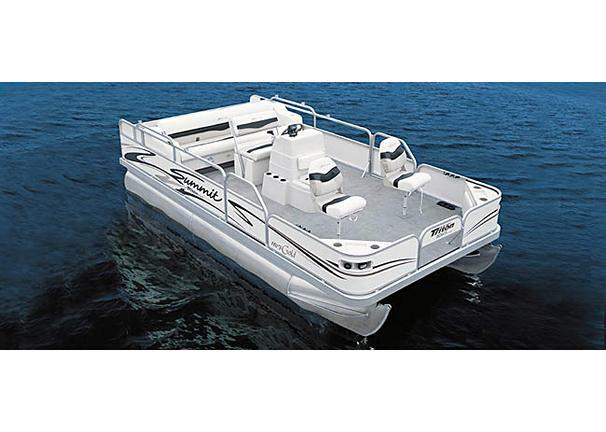 Boat Description The Triton Summit Pontoon 180 F Gold is our most sensibly-sized and affordable fishing pontoon. This roomy 18-footer is the perfect first boat for your active and growing family. Itll hold up to 9 persons, and comes handsomely equipped with two pedestal fishing chairs, aerated livewell and a rod storage locker. The center console design provides plenty of elbow room when fighting that trophy fish. Or, let the rest of the gang fish while you catch some rays.